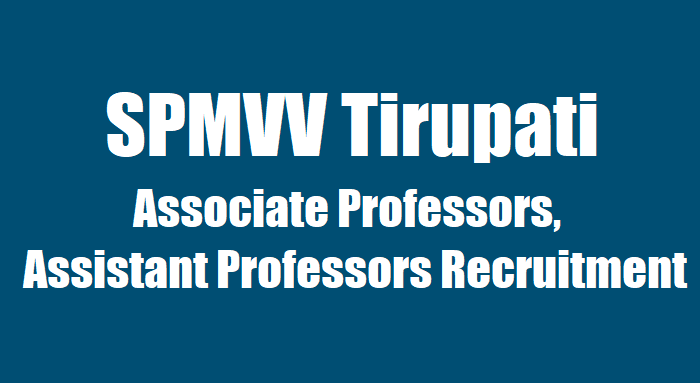 SPMVV, Tirupati - Associate, Assistant Professors Recruitment 2018, Last date to apply is 31.01.2018 for SPMVV Associate, Assistant Professors Recruitment. 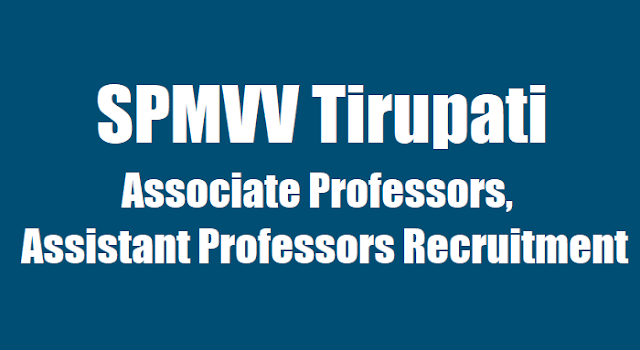 Sri Padmavati Mahila Visvavidyalayam, Tirupati invites applications to fill the Backlog vacancies of Associate Professors and Assistant Professors. (Women’s University), TIRUPATI-517 502, A.P. Online Applications are invited from only women candidates for the posts of ASSISTANT PROFESSOR in the following departments. For the Registration, Submission of Online Application with eligibility criteria, Research, Experience, Registration fee and other details, please visit the website http://sche.ap.gov.in/ASSTPROF/Masters/HOME.aspx, and go through the link with University website www.spmvv.ac.in. Filled in online application along with acknowledgement of Registration fee, can be downloaded and submit the same with all necessary documents to The Registrar, Sri Padmavati Mahila Visvavidyalayam, Tirupati-517 502 on or before 30-01-2018by 5.00 P.M. Further, the candidates applying for the post of Associate Professor in the Department of Applied Microbiology can download the application and submit to the University by 30-01-2018. The qualifications prescribed and other conditions along with the Application Form can be downloaded from the University website www.spmvv.ac.in. 1. The Direct Recruitment to the Post of Assistant Professors in the University shall be on the basis of Merit through All India Advertisement and Selections by the duly Constituted Selection Committees as per the provisions made under UGC Regulations 2016, dated 30.08.2016 ( Minimum Qualifications for appointment of Teachers and other Academic Staff in University and measures for the maintenance of Standards in Higher Education) (4th Amendment) and G.O.Ms.No.38, Higher Education (UE) Department, dated 23.06.2016.
i) Good Academic Record as define by the concerned University with at least 55% marks (or an equivalent grade in a point scale wherever grading system is followed) at the Master’s Degree level in a relevant subject from an Indian University, or an equivalent Degree from an accredited foreign University. ii) Besides fulfilling the above qualifications, the candidate must have cleared the National Eligibility Test (NET) conducted by the UGC, CSIR or similar test accredited by the UGC like SLET / SET. iii) Candidates, who are, or have been awarded a Ph.D. Degree in accordance with the University Grants Commission (Minimum Standards and Procedure for Award of Ph.D. Degree) Regulations, 2009, shall be exempted from the requirement of the minimum eligibility condition of NET / SLET / SET for recruitment and appointment of Assistant Professor or equivalent positions in Universities / Colleges / Institutions. on his / her Ph.D. work. (a) to (e) as above are to be certified by the Vice-Chancellor / Pro-Vice-Chancellor / Dean ( Academic Affairs) / Dean (University instructions).” “Ph.D. Degrees which are pursued either full time or part time will be treated as Degrees awarded through Regular Mode provided these are in conformity with the existing Statutes / Bye laws / Ordinances etc. of the Degree awarding University. However, the Ph.D. acquired under distance mode is not permitted”. iv) NET / SLET / SET shall also not be required for such Masters Programmes in disciplines for which NET / SLET / SET is not conducted. v) A relaxation of 5% may be provided at the graduate and Masters level for the Scheduled Castes / Scheduled Tribes / Differently – abled (Physically and visually differently-abled) / Other Backward Classes (OBC) (Non-creamy layer) categories for the purpose of eligibility and for assessing good academic records during direct recruitment to Teaching Positions. The eligibility marks of 55% marks (or an equivalent grade in a point scale wherever grading system is followed) and the relaxation of 5% to the categories mentioned above are permissible, based on only the qualifying marks without including any grace mark procedures. vi) A relaxation of 5% may be provided, from 55% to 50% of the marks to the Ph.D. Degree holders, who have obtained their Master’s Degree prior to 19 September, 1991. Relevant grade which is regarded as equivalent of 55% wherever the grading system is followed by a recognized University shall also be considered eligible. The Application Fee for the Post of Assistant professor is Rs.1,000/- for Open Category and BC Category and Rs.500/- for SC and ST Categories. Date & Centre of the Screening Test: The date and venue of the on-line Screening Test will be communicated through the registered e-mail mentioned in the Application of the Candidate. Further, the date of Screening Test will be communicated through the University website (www.svuniversity.edu.in). The Candidates are informed to browse the University website for latest updates. Syllabus of the Screening Test: The Syllabus of the Screening Test is hosted on the University website. Scheme of the Screening Test: The test will consist of two papers, Paper I, Common to all Candidates, will be Teaching and Research Aptitude, while Paper II will be concerned Subject. Paper I and Paper II put together are for 300 marks. Paper I will contain 120 objective type questions for 120 marks (each question carries 1 mark). For Paper II, the Candidates have to answer 180 objective type questions for 180 marks (each question carries 1 marks). Duration for Paper I is 2 hours & Paper II duration is 3 hours. carry 1/3 negative mark for the question. an eligible Candidate to the oral interview in case of OC Category is 40%, BC Category is 35% and for SC, ST and PH Categories is 30%. Interview according to the terms and conditions notified in the advertisement by the University. Downloading of the Hall Tickets: Hall Tickets can be downloaded 7 Days before commencement of the on-line Screening Test.